The Virsky studio ladies have been so welcoming to us, like our new friend Oksana. Many of them speak English, but it's fun to practice our (very limited) Ukrainian with them too. The studio is a two-year program. 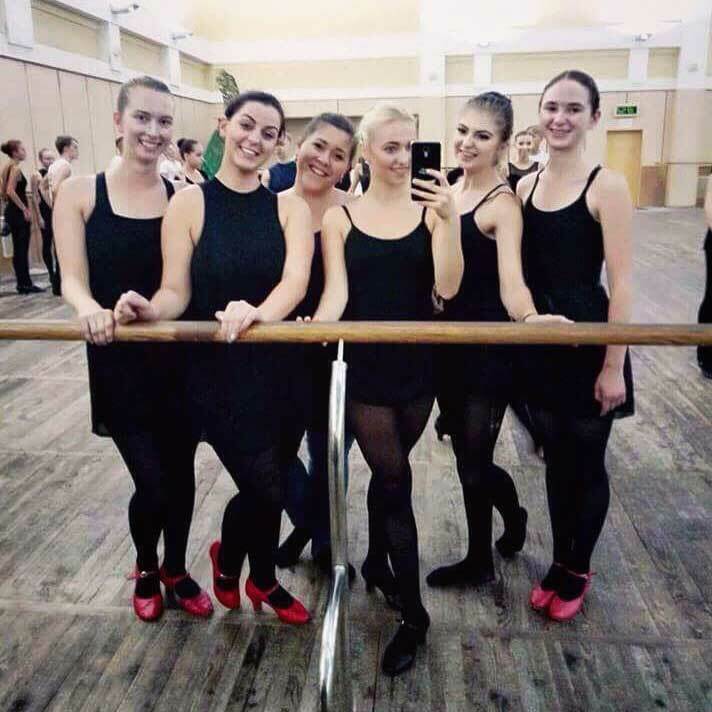 To get into the professional Virsky company, dancers train with the studio group for at least a year, but most do so for two years. The one year is mostly for special circumstances, as I understand, for example, if a Canadian wanted to audition for Virsky (like Lana Niland from Postmark Ukraine, who danced with Virksy about 10 years ago). After the two years, the studio dancers can audition for the company. The number of available spots depends on the year, but sometimes there's room for only a handful of dancers. The studio dancers attend high school (which goes up to Grade 11) or university during the day then come to the studio during the evening. It's truly amazing how they manage to do it all, seeing as us Canadians/Americans sometimes have trouble finding energy to go to dance class after doing next to nothing during the day. Dance takes a lot out of you! So besides dance, and when we push through our tired minds and muscles, what are we up to? Check it out below! Tuesdays and Thursdays at 11 we have Ukrainian language lessons. The seven of us dancers meet at a cafe near our apartments with our instructor, Anna. We've only had a few lessons so far. (Привіт! Мене звати Кейтлін. Я з Канади. Я живу Винніпеґо. Мені подобається вишневий сік.) We're learning basic phrases and words and trying to connect them into sentences. If it's Monday, Wednesday, Friday, or Saturday morning, then we're free to do what we want. There are so many cafes (with $1.50 CAD cappuccinos), shops (there seems to be a mall at every corner, some of them underground that you pass while crossing streets with no pedestrian walkways — think Portage and Main in Winnipeg), and neighbourhoods (that are easily accessible by foot) for us to explore, so we keep busy. One of our favourite go-to stores is Grand Prix, a dance store. Dancing every day means we go through lots of tights, body suits, and slippers, but thankfully dance supplies is affordable here. My first couple days here, I bought four body suits, a pair of tights, and slippers, and it came to $50 CAD...I probably would have paid that for one item back home. I spend quite a bit of time reading online about Kyiv and things to do. I was looking up thrift stores to go to and came across Laska. So I went walking one morning, and just when I was about to go home because it wasn't where Google Maps said it should be, I walked half a block more and found it. And oh, it was wonderful. There was a mix of new and old items. Clothing and shoes were used, but some leather bags and homeware items were new and made in Ukraine. The secondhand items were similar to prices at home, ranging from $4 to $20 CAD (so more than Winnipeg's thrift shops like MCC Thrift or Salvation Army, but not as much as Winnipeg's vintage shops like Nettie and Min or Vintage Glory). I'm a big fan of thrift stores for both the price and style. Stay tuned for a future post about our thrifting experience we had this weekend (imagine: warehouses upon warehouses of gently used clothing). Our free mornings are also great for grocery shopping. So far the consensus of the best grocery store is Megamarket, because of its selection of groceries on the main floor and housewares/drugstore items/anything else you need on the second floor. Ukrainian folk art covers the walls of the building Virsky's studio is in. We go about an hour early to rehearsal to stretch and limber up before we start dancing. And since it takes half an hour for us to walk to the studio, we don't really have much free time in the afternoon. But this past Friday we did go early to the studio to watch the company in an orchestra rehearsal, a full run through of the group's upcoming shows with live music. And wow. I saw an orchestra rehearsal about a month ago with Troyanda, and watching the company blew me away then. Same goes for this second time. The energy in the room was unbelievable. The dancers were "on" the entire time. Their smiles made me smile. Their fake tears made me tear for real. Myroslav Vantukh, the artistic director of Virsky, sat in a chair at the front, watching the perfection unfold in front of him, and when it wasn't perfect (perfect to him, that is — everything looked pretty perfect to me), he'd stop the orchestra and the dancers and have them do it again. It was inspiring to watch. I still can't believe that every day I dance in the same studio as the company. Monday to Wednesday and Saturday, the girls start dance at 4:30 p.m. Thursday and Friday, we start at 6 p.m. The boys have the opposite start times as us, except for Saturday when they start at 3 p.m. Every day, we do an hour and a half of ballet. MTW girls have an hour and a half break before our next class, and boys have their break TFS. Besides ballet, on Mondays and Fridays we have character class, Tuesdays and Thursdays choreography, and Wednesdays and Saturdays technique (and sometimes more choreography on Saturdays). In a future post I'll go into more detail of what we actually do in each class. We end rehearsal by 9 p.m. And by that point, we're pretty tired so usually go home straight to bed (after we unwind a bit — I know I have quite a bit of energy right after practice but then abruptly crash). Since we're pretty hungry by this time, we sometimes stop on our way home for something to eat, like a deep-fried hotdog from Kyivska Perepichka. We have only Sundays off, so we try to make the most of them. Last weekend we went to Kaniv to see a museum about Taras Shevchenko and his burial site. In a couple of weeks we're going to Chornobyl, and we also plan to go to the Mezhyhirya Residence, the former president of Ukraine's home, now a museum, that people call a symbol of corruption. Have any suggestions of places we should see, restaurants we should eat at, or stores we should shop? Let me know in the comments!